The ASC automatic strand conveyance system is modular, allowing for easier adaptation to the requirements of the process. Coperion Pelletizing Technology GmbH has developed an automatic strand conveyance system (ASC) often required by compounding systems for pelletizing at very high throughput rates. Designed to work in conjunction with Coperion's two large strand pelletizers, the SP 500 HD (working width 500 mm) and the SP 700 HD (700 mm), the conveyance system is available in two sizes: the ASC 500 for throughput rates of up to 3.5 tons/hour and the ASC 700 for up to 5 tons/hour. The conveyance system automatically guides the extruded strands via a cooling water chute and downstream conveyor belt into the feed mechanism of the pelletizer. An automatic start-up mechanism facilitates the start-up operation, while any possible machine malfunctions caused by broken strands are avoided by the system's ability to rethread the strands. Compared to other processes, strand pelletizing can help ensure a gentle treatment of the product, as it operates with much lower pressures. Other convincing advantages are the reduced complexity of the system and the low rate of wear. These benefits combined with its relatively low operating costs make strand pelletizing an obvious choice for the compounder. The new SK92 die head has been developed for high throughput rates. Homogeneous heating/cooling ensures completely uniform extrusion of the strands across the entire width of the extrusion die. The die head is distinguished by its optimal rheology and efficient heat transfer, providing maximum possible throughput while helping ensure gentle handling of the product. This feature makes the SK92 die head suitable for the increased throughput capabilities of the ZSK Mc18 extruder series. The ASC automatic strand conveyance system is modular, allowing for easier adaptation to the requirements of the process. 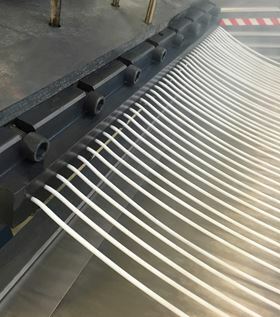 If, for example, the extruded material requires more intensive cooling, the strands – after being cooled in the water chute – can also be spray-cooled with cold water on the downstream perforated conveyor. The spray bars used for this purpose can be turned on and off individually and can be readily exchanged during regular maintenance operations. Freely positionable suction stations in the conveyor system generate powerful streams of air that free the strands from adhering water. This post-cooling unit can also easily be converted to an intensive cooling section, if required. A strand drying unit in the last section of the conveyor system ensures that residual moisture is absolutely negligible when the strands are fed into the pelletizer. This story is reprinted from material from Coperion, with editorial changes made by Materials Today. The views expressed in this article do not necessarily represent those of Elsevier. Johns Manville (JM) has launched a new chopped strand for PBT/PET reinforcement.